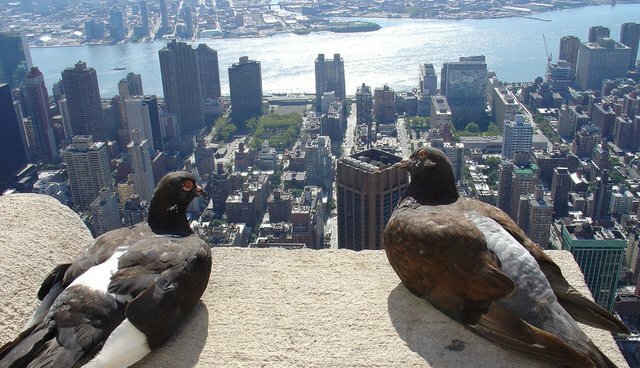 Who is stealing NYC pigeons? A white van drives up to a flock of pigeons, men come out of it, scoop hundreds of pigeons up in a giant net, get back in the van and take off. Here are some questions about what went down and answers you'll wish you'd never read. This was far from the first mass pigeon abduction. The people of NYC have for some time been reporting that exact "men in a white van" scenario, all cases taking place in popular pigeon spots around the city. Most citizens assume these are city officials, carrying out some form of pigeon pest control. Therefore, nothing is being done. The men get away every time. Who is stealing the pigeons and what for? Witness reports from Washington Square Park say it was just two men. However, it is a known fact that there is an entire organisation standing behind the abductors. Yes, organised pigeon crime. It's a mindless, cruel and, worst of all, legal business that organises "pigeon shoots". For this purpose, pigeons are trapped, have their wings clipped, and then launched into the air as a target for someone to shoot at. Where are they taking them? The end destination is Pennsylvania - soon to remain in history as the state welcoming animal cruelty. Open fields, armed men and pigeons shot into the air to become somebody's moving target practice. Who is profiting and who is sponsoring? Believe it or not, there's a lot of money to be made from such insanity. 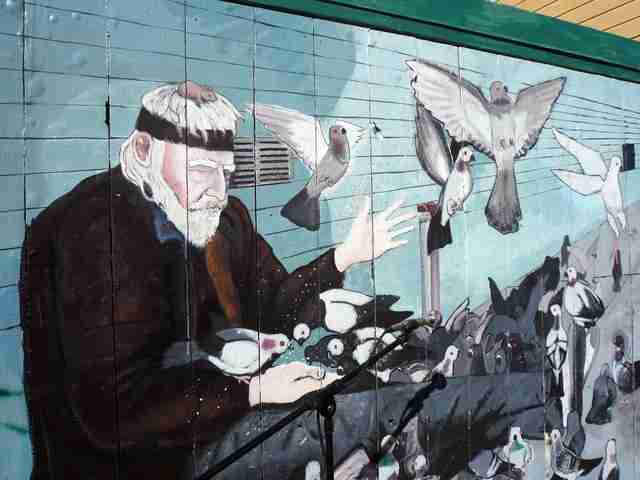 The people who steal the pigeons get about 2$-3$ per 'piece', which adds up to nearly 900$ a week. However, the people organising the live pigeon shoots - they get 50$ per pigeon! Bored, stupid, rich people pay a good amount of money to participate in the West's most disgusting sport, mistaking cruelty for entertainment. All of this, brought to you by the National Rifle Association* - a legal, multi-million establishment. For reference, the NRA's CEO - Wayne Lapierre - gets an annual salary of $972,000 for his contribution to society. Live pigeon shoots are a tradition in PA, one that activists have been trying to stop for decades. Here you can read all about their fruitless efforts to get the House of Representatives to even consider banning the events in 2014. The NRA* interfered with a heart-warming campaign on freedom and weapon privilege. In the meantime, NY police is 'investigating' and watching the park cameras closely. A symbolic effort at best. Officials are not getting any closer to putting a stop to the pigeon shoots and are obviously not getting any help from legislators, pressured by multi billionaires and po werful conservative figures. What's left? The people. Vigilance and action is expected out of regular people like you and me, because it won't come from anywhere else. Most of all - compassion! While the pigeon is genuinely considered an urban pest, that is not the entire truth. The pigeons are a part of the urban ecosystem, contributing by eating up all of the food that people throw away. Take away the pigeons, you've got an increased rubbish crisis on your hands - therefore a worsened rat infestation problem. Their entertainment can't even be considered inhumane pest control, because it isn't. Nobody benefits from pigeon torture, except for people who expect to be treated as businessmen, while their 'business' model is based solely on guns and animal cruelty. This is not about whether it is legal to shoot pigeons. Not only in the US, but in London too - it is. Shooting live pigeons is somehow legal as a form of pigeon control in London. It's impractical and ineffective, because it doesn't do any work in reducing the pigeon population. There are numerous ways of humane pigeon control that do the job. Nonetheless, as you see, the world is not concerned with dying pigeons. 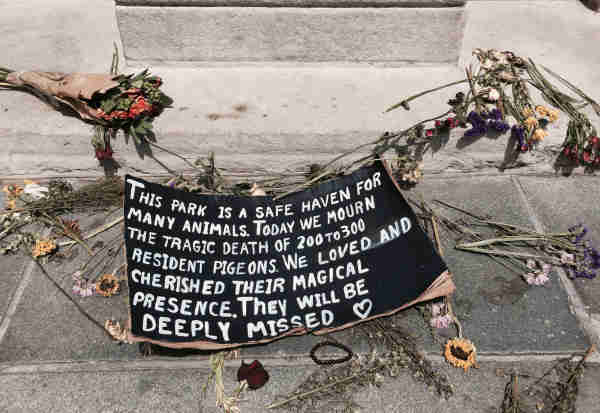 We should not and will not tolerate the mass murder of free birds, taken away from our parks, starved and mutilated - only for the purpose of someone's profit and entertainment.